To casual observers, Jimmy Buffett’s die-hard fans — affectionately known as Parrot Heads — merely look like a bunch of colorful folks who’ve fallen in love with the escapism fantasy marketed my Jimmy Buffett and his music. They gather together in parking lots outside concerts to dance, mix margaritas, limbo, and dress in Hawaiian shirts with shorts, flip-flops, leis and even coconut bras — and that’s just the guys. That description certainly is familiar to me as a Buffett fan myself. However, Parrot Heads are only those crazed colorful creatures for isolated moments in time. Most are normal folks whose days are usually filled with budget meetings, fighting with the copier, and getting the kids to school and ball practice. But there’s another side to Parrot Heads — an official side that I ran across in my work here at The Fuller Center for Housing this week. We received a $1,000 donation for our Disaster ReBuilders‘ work in Texas, where leaders and volunteers have been helping families recover from Hurricane Harvey for more than a year now. Many have supported this work and donated to the cause, but this particular donation came from a first-time donor to The Fuller Center for Housing, the Galveston Bay Parrot Head Club (pictured atop this post). The club is part of a worldwide federation of local Parrot Head Clubs that operate under the umbrella of a nonprofit called Parrot Heads In Paradise. It all began in 1989 in Atlanta, Georgia, when a few Parrot Heads wanted to get together more often than just once a year while tailgating before a Buffett show. Inspired by Buffett’s Save the Manatee nonprofit and his other charity efforts, they also wanted it to be a platform to support the good work of charities and nonprofits. 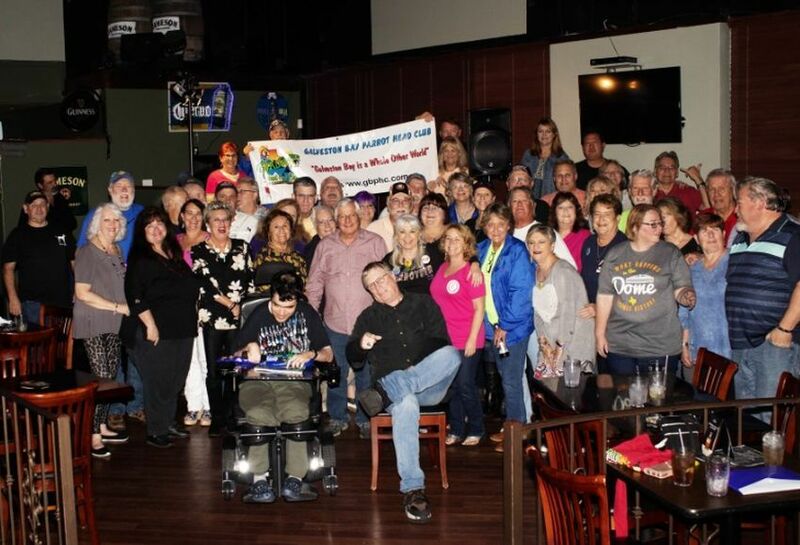 With the blessing and support of Buffett’s Margaritaville, Inc. empire, Parrot Head Clubs have exploded around the world with more than 200 chapters across the U.S. and Canada, as well as in Europe, the Caribbean and Australia. The clubs bring Buffett fans together for fellowship, fun and for something else The Fuller Center for Housing knows a little about — building a better world. In the past 16 years alone, Parrot Head clubs have contributed more than $50 million to charity and volunteered more than 4 million hours. The Galveston Bay Parrot Heads have raised money for Shriners Hospitals, the Alzheimer’s Foundation, organizations supporting animals and environmental groups. They prepare food packages for the local food bank, participate in conservation activities with the Galveston Bay Foundation, honor veterans through Wreaths Across America and hold an annual blood drive for the M.D. Anderson Cancer Center. In the aftermath of Hurricane Harvey, they cooked and delivered more than 15,000 meals to victims and first responders. Now, the good work of the Fuller Center Disaster ReBuilders is on their radar. The Fuller Center is thankful for all of its supporters, even those who think it’s perfectly normal to walk around with a foam parrot on their head. Thank you for reminding us that it’s good to party — and even better to party with a purpose. HOW WONDERFUL! I HAD NO IDEA!! !